PR31 is a regular user of the slow cooker for our family meals. We get the boys to bed at night and then she slips into the kitchen to prep a roast or some chicken or soup. Then she puts it in the slow cooker on low to cook overnight. Oh, man! When I wake up the next morning and go into the kitchen to make the sweet nectar of Heaven (aka, my coffee), I could practically gnaw my arm off because that food in the slow cooker smells so good and I know I have to wait to get some of it till lunch. I think my mouth is watering right now as I type. There are times when Angela has to “rush” a meal. Maybe she forgot to put it in the slow cooker before she went to bed, and now for it to be ready by lunchtime she has to put it on the high heat setting. But she doesn’t like doing that because the meat and vegetables just don’t turn out the same. And the juices or gravy or soup just don’t have the same flavor. Low and slow seems to make things the most tender and have the best flavor. In a worst-case scenario, we sometimes try to rush a meal even more by cooking things in the microwave. But while the microwave takes a fraction of the time a slow cooker takes, it also leaves things more tough or rubbery. And sometimes foods don’t evenly cook all the way through. Sure we can get to the meal more quickly, but it’s not the kind of meal we would savor as much. It’s more of a meal of necessity… just filling hungry bellies. I wonder why we can so easily understand that food cooked a slow cooker overnight is going to taste better and be more appealing than food nuked in a microwave for a few minutes… and yet we struggle to understand that God may be trying to make something better out of us by letting us simmer in a situation for a longer period of time than we want. Were God to rush the process in our lives, we might turn out tough and not taste good to the world around us. Instead, He wants to work into us all the good flavors of Himself & tenderize our hearts for others before He let’s us out of the holding place He has us in at the moment. And when we come out of that slow cooker part of life, people we come in contact with will be chomping at the bit to be around us. There will be an aroma and flavor of Christlikeness which will attract people to what’s going on in us… all because we cooked low and slow. 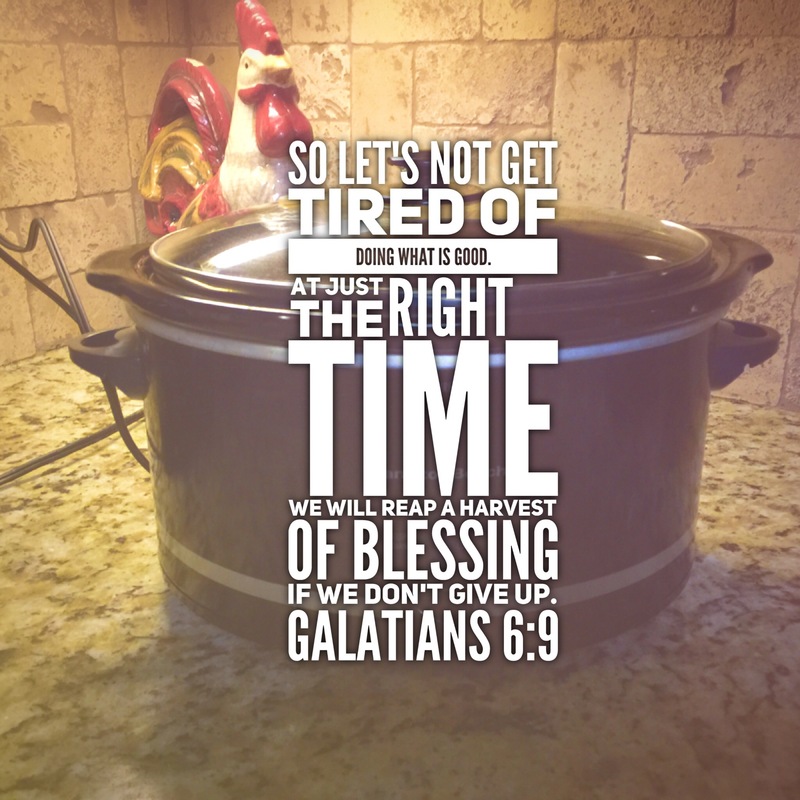 I don’t know what dish He may be cooking up with you, but if you’re in a slow cooker part of life right now, I can tell you that you’re in a good place. Stay put, simmer a little, soak up a lot of Him and get ready to make an impact!